Each of us can point to someone in our life whom we look to for advice. This individual provides not only encouragement but also tells us the hard truth and sets us straight from time to time when we have strayed from the path. I was blessed to be present recently for a reunion of a man and his mentor. 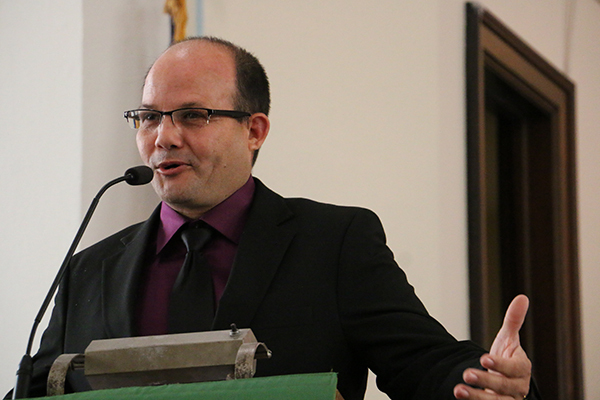 Pastor Luigi Perez was born and raised in Cuba. He credits God for his ministry and the Rev. Javier Diaz with guiding his journey. Diaz was his pastor and his district superintendent for five years before Perez escaped from Cuba six years ago. He welcomed Diaz to the pulpit at Willard Grace United Methodist Church (Firelands District). Diaz is pastor of one of the largest Methodist churches in Cuba, and is a professor at the Evangelical Methodist Seminary there. The trip to Ohio, Kentucky and Alabama provided him and his wife Anna the opportunity to visit pastors they mentored in Cuba. “I am very happy to be here and see Luigi and his family,” Diaz, who does not speak English, said through an interpreter. “Today is an exciting day as people from different countries and of different languages will come together to worship God,” Perez told the congregation. People came from Willard, surrounding communities and from across the East Ohio Conference to hear Diaz preach his message, “Act of Faith.” It was based on the story found in Mark 5:21-34 of the woman who was healed by touching the cloak of Jesus. Johnny Solis and his wife Angie lead a Spanish-language worship service and teach Bible study as part of the ministry across town at Willard First United Methodist Church. They and many from the church were on hand to hear Rev. Diaz preach. Larry Schafrath made the trip from Wooster to Willard to see Diaz and Perez. He met the two men in Cuba 15 years ago when he was on a mission trip there with the Rev. Allan Bevere.